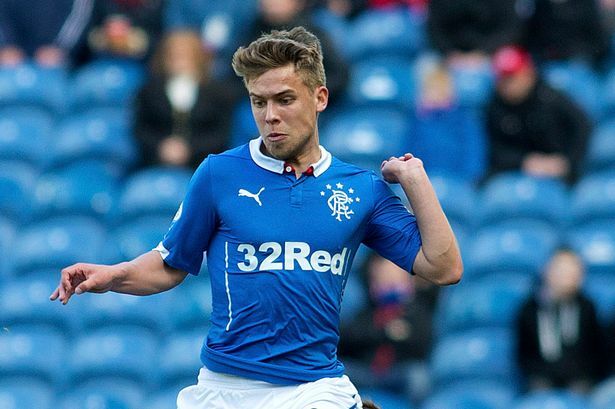 Ibrox Noise: Is Rangers' youth good enough? Is Rangers' youth good enough? In recent days Tom Walsh’s loan to Dumbarton was officially confirmed, adding to a glut of Rangers’ youth players to have departed either permanently or on loan since Mark Warburton took the reins. Indeed, the only significant Murray Park products still at Ibrox are Fraser Aird, Ryan Hardie and of course Barrie McKay. The past six months have seen the Calum Gallaghers, Andy Murdochs, Robbie Crawfords and a host of others either being lent to other clubs or being sold to them outright. This begs the question; have we, as fans, over rated some of the younger players in a misguided attempt to build from within? Football fans love the romanticism of youth players breaking through from the bread and butter ranks of the club to become part of the fabric of the first team, with Manchester United’s legendary Beckham clique a prime example of such an occasion. And Rangers’ travails into the-then Third Division saw many believing the Ibrox men had a chance to begin again and cultivate a grass roots team comprised of our own blood. Naturally, that did not happen with then-manager Ally McCoist electing to sign in dross from elsewhere rather than using the Academy offspring. And Mark Warburton, in McCoist’s defence (rare these days), has done very much the same thing (while signing admittedly far better fare) – replace McCoist’s Lewis Macleod with Warburton’s Barrie McKay and Rangers’ current boss has otherwise not trusted Rangers’ youth enough to install them in the first team. It is not even an age issue; he signed Dominic Ball on loan from Mauricio Pochettino’s Tottenham Hotspur on loan, a defender the same age as Luca Gasparotto – but it is the latter sent away to another club rather than being adjudged good enough to start for Rangers while Ball has certainly not done badly in Govan. And likewise he has brought in loanees like Gedion Zelalem, 18, and Nathan Oduwa, 19, as opposed to using Walsh, 19, and Calum Gallagher, 21. There is also the oft-told tale of Andrew Murdoch, 20, a player Warburton simply never fancied, and rather played an attacking midfielder (Halliday) out of position than give the kid a run. But before it sounds like I am castigating the Hat for this course of action, I should point at the results and displays. A bit of a form dip mid-season aside, Rangers have been stellar this season, and it has justified every action he has taken. McKay has been an integral part of that, and he has more than justified his place, but in terms of Rangers’ youth he is in the minority. Warburton does not appear to have a huge deal of faith in Rangers’ younger products – and maybe that is a reflection of what Murray Park has produced in the past few years as opposed to a disappointing dismissal of using home-grown talent. You have got to face up to the fact that the current crop inherited by the hat have not been good enough. While he has been patient he clearly has an eye for talent( as does his team) and has chosen to get rid of those not in his plans and farm out the rest as a final test for them to come back like Barrie McKay, the onus is on them, their future is in their own hands. The hat has constantly stated that if he can bring someone in who adds more quality he will do so, on that ethos,one comes in one goes out- simples. For me the guy is doing an outstanding job,his root and branch approach is a blueprint for any aspiring manager to succeed. Our man is a wizard, in fact he's the wonderful wizard of warbs. Only one way to find out. In fairness should have found out before now only for Ally to want to use a sledge hammer to crack a nut. The answer is no.They simply are not good enough,at least in the eyes of the man who's opinion matters most,Warbs.It speaks volumes for a man who utilises youth so much that our home grown talent has all been farmed out.But they are all part of the old regime in place before he put his own stamp throughout the Club.His ideas are now being implemented at all levels.I like Murdoch but W clearly doesn't rate him and its his word that counts. Wouldn't really argue but would point out that Murdoch's contribution was to an ultimately failed attempt while Zelalem looks like making his effort in a winning campaign. Know which I prefer. There is a fair possibility that all you say is correct, although it is possible that Murdoch and other may develop into useful players, I certainly hope so. But if you are right where does that leave Craig Mulholland and his staff. Is there no talent around and they are having to work with scraps or despite all the resources at their disposal are they incapable of developing promising youth players? Ross Perry and Kyle Hutton and other were with Rangers for 12 years or so at a time, initially, when we should have been recruiting and developing players of potentially Champions League standard and yet when it came to the crunch the manager did not rate them able to compete at a level above the effective fourth division in Scotland. Its a worry going forward and at best a question mark over the set up at Auchenhowie. This is not a question of whether Warburton finds Rangers produced young talent valuable....but how many of that ilk have gone on and furthered their career's in a bigger league and become top quality players? So not only is it Warburton who doubts the quality of the present stock but the actions of all clubs, scouts etc would seem to vindicate his position. Is it the Academy? I don't know, but has it gone on for a very long time with Rangers youngsters? I would say most definitely yes...leading to the conclusion that we cannot pick out young talent to nurture like many of our competitors seem to do. Warbs has built a very strong squad as such i would expect that when dealing with players in the academy he will be farming them out to get game time rather than sit about. The more experience the boys get the better. Anyone that leaves will be in the interest of Rangers and the player, if not in the managers plans then why waste time. There is talented players but they may not have had the correct coaching and training to progress. Warbs has a record of getting the best out of players and he will have a plan. OK Lets get this into perspective are Gedion Zelalem, and Nathan Oduwa, good enough for Arsenal or Spurs..... Answer....NO not at the moment hence the loan move. Dont write the youngsters off yet they need game time and loaning them out is the answer. Hopefully after a season or 6 months they come back better, Stronger, more experienced. Warbs has rightly said that these players need game time before they are ready. Perhaps these other players that have been brought in from a higher level just have more natural talent than our lot. When Warb and Weir came to Rangers, they immediately assessed the players from first team to youth. They all had a "blank canvass" to prove their worth to Warbs. The youth obviously were not good enough, because if they were, Warbs would play them, simple as that. Now, before Warbs/Weir came to Rangers, our youth system was headed by a poor scouting system that brought those mediocre players to Rangers youth at a young age. Its all about having a good eye for a player and playing/training them properly so that they can develop into a first team player. What I now suspect is that our new scouting network will bring in the best, highly skilled youths to Rangers, and they will be trained accordingly so that they will increase in value to either play for the first team or sell on for a profitable price for our club. We had to get rid of the dead wood and that includes those in the youth team. We have a promising scouting network ran by McPartland, so hopefully our kids will come through stronger and add value to our club.